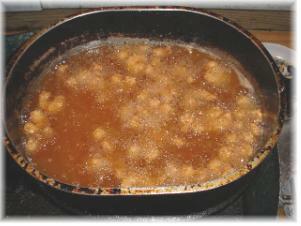 These are pictures of a batch of shrimp frying to illustrate how watching the bubbles tells you the doneness of the fried food. 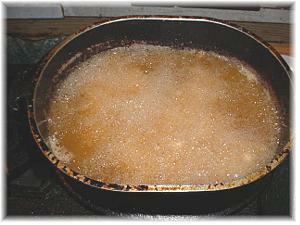 This method works for everything fried. It may take a while to load... please be patient..... 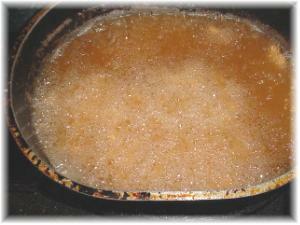 There are four pictures and the oil was about 365ºF. The first picture shows the most bubbles, that's when the shrimp were just put in. You'll notice the shrimp start to appear on the third picture. The last picture is when they are done, I took them out as soon as I put the camera down. This whole process took about three minutes. Also notice that I didn't load the pot up with shrimp. Doing that kept the oil hot and allowed them to have a slightly crisp outside and tender inside. 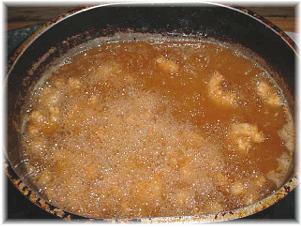 Putting too much shrimp, or any other food, will cool the oil down too much and give you an overdone and soggy mess. The bubble check holds true for all fried foods. Keep your thermometer in the oil or put it in after each batch, you'll know what's happening at all times.